The XpressMusic branding raises the bar high for the Nokia 5630 music player. While it's pretty good, it's by no means exceptional: just on a par with other recent Symbian devices. It has a huge number of supported audio formats, including MP3, AAC, eAAC+ and WMA but little to top the business-oriented Nokia E71 for example. However, the dedicated music keys on the side and the new active standby layout, where the music player is one click away, are things that enhance the sonic experience. Quite naturally, the player can also be minimized to play in background. In this case a tab replaces the Ovi Contacts tab on the stand-by screen and indicates the currently running track. Sorting your songs by artist, album, genre and composer is automatic and searching tracks by gradual typing of the desired name is also available. Tracks are transferred to Nokia 5630 via Bluetooth, USB or by simple download. You can also use a card reader for that purpose and transfer them directly to your memory card. Upon completing a USB transfer, or inserting a card, the phone automatically prompts to scan for new music tracks and, if allowed to do so, adds the new ones to the music library. The player comes with five equalizer presets and, should they seem insufficient, you can edit them or create new ones in a matter of seconds. Nokia 5630 XpressMusic also features an innovative feature called Say and Play. By using the phone's built-in speaker independent voice recognition, it allows you to play any stored track by simply saying its title or artist. The Nokia Say and Play feature currently supports English and the pre-installed UI languages. However it should be able to pick up titles in any languages if they are pronounced in an English manner or with UI language pronunciation. To search the tracks, the Say and Play features uses the metadata embedded into the tracks. If no metadata is stored, the handset will create ones based on the filename. The audio quality of Nokia 5630 is pretty good as one might expect from a handset, titled XpressMusic. 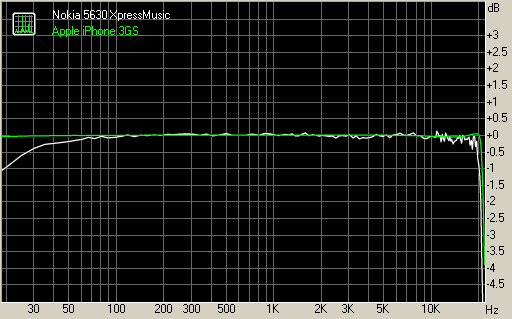 Except for the slightly high total harmonic distortion and intermodulation distortion, all the readings are excellent. The noise level and dynamic range of Nokia 5630 XpressMusic are excellent, easily rivaling dedicated music players. As you can see from the table it even outscore the Apple's iPhone 3GS on those and that is about as good as we have managed to test. The same hold true for the stereo crosstalk. The frequency response of the Nokia 5630 is simply great, remaining within 0.26 of the perfect line throughout the range. Nokia 5630 features Real player for playing your video clips and the video player can be displayed in both normal and fullscreen modes. When in full screen, the softkey functions are hidden so that they don't spoil the viewing experience and only pop up when a key is pressed. With such a small screen though, video playback is not this phone's strongest suit. And to confirm that, if you want DivX/XviD playback you'll need to install a third-party player. The FM radio on Nokia 5630 has a nice simple interface and can automatically scan and save the available stations in your area. RDS support is included and the Visual radio is also on-board. If internet connection is available, the Visual radio application can download all the local stations and save them to the handset with their names. Should you ever get bored of local radio stations and are in range of a Wi-Fi network, Nokia 5630 offers Internet radio with an extensive directory of stations and the option to save the best in Favorites. You can stream stations over 3G or even GPRS with separate settings for the audio quality, but it's probably not worth it. Searching for stations can be done by name, genre, language or country or if you can't find what you're looking for you can always add a station manually.